The length of the lorica (LL) of Keratella cochlearis cochlearis and of K. cochlearis tecta and the length of posterior spine (PSL) of the latter morphotype were measured in the strongly eutrophic basin and also in the mesotrophic basin of Lake Biwa, Japan, from September to December, 1980. In the population from the mesotrophic basin, the individuals with longer PSL prevail and the tecta forms are extremely rare. The LL values of both morphotypes from one sample do not differ. In December the LL increased to 95 µm in both morphotypes from 80 µm observed in September, while the PSL values decreased abrubtly in both basins in the middle of this period. It is suggested that the observed increase of LL could be related to the thermic factor, i.e. a steady decrease of water temperature, and the changes of PSL are correlated with the increase of nannoplankton and detritus aggregates noted in November. 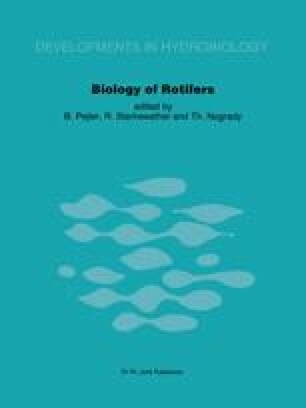 In this month an increase in fecundity and in the total numbers of rotifers took place as well (Hillbricht-Ilkowska, in press).